Series C Chemical Metering Pumps are an industry standard for more than 20 plus years. 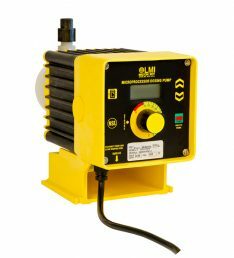 The C series metering pump is designed for municipal and industrial pumping applications, the extremely familiar yellow and black LMI metering pumps are completely rugged, totally enclosed and have a chemically resistant housing for protection in extreme environments. The electronics are enclosed and a rigid housing and stroke bracket ensures many years of precise, repeatable performance. Adjustable stroke frequency and the flexibility of up to 1000:1 turndown ratio, Manually adjustable stroke length provides accurate pump output adjustment, NEMA 4X / IP65 enclosures for protection against corrosive environments, Time tested electronics for reliable, repeatable performance, Totally encapsulated electronics for protection against moisture and corrosive conditions, Inputs for low level switch available on certain models, Models with external pacing for flow proportional applications, Advanced control options for simplified system integration (pulse multiply/divide, 4-20 mA, remote on/off), UL, CUL, NSF 50, NSF 61, CE Certifications.